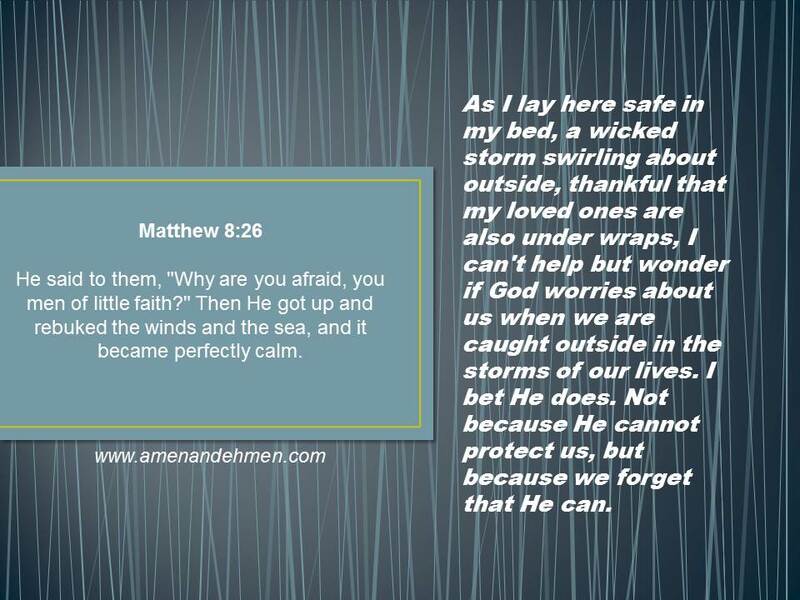 In The Storms… | amen and ehmen! Just want you to know that your posts are reaching me and are very encouraging. I used to journal regularly but have stopped for a reason I know not. Your encouraging words have given me the courage to start again. Small beginnings. It is a safe easy way to say what is in my heart. So much has happened and changed over the last few years. No need for me to ramble just wanted to say thank you it is easy to take things for granted and just wanted to make sure that all you are doing is being noticed and helping people like me that have only God and paper to talk to. Thank you I would love to have something profound to say but my best is simple I really appreciate what you are doing and the courage for you to be honest has helped me to take a look at myself. I just looked up and am seeing our first snow flakes. They are beautiful, I love this time of year it reminds me again that my Father washed away my sin. So thankful for Him and you his faithful servant. Sincerely Nancy.